Local pharmacist, Jeff Harrell of Peninsula Pharmacies traveled to Washington, D.C. for the National Community Pharmacists Association’s (NCPA) Congressional Pharmacy Summit from May 24-25 to advocate for Congressional action to promote transparency in how payments for many generic medications and other hidden fees are calculated. Peninsula Pharmacies and other independent community pharmacies are trusted health care resources that provide face-to-face counseling to patients, promote adherence to medication regimens, and dispense cost-saving generic medications. Unfortunately, independent pharmacies are often left in the dark about what their reimbursement for these medications will be and whether other hidden fees will be charged to them. For example, they may be reimbursed $50-$100 or more below their cost at the time they dispense a medication, then weeks or months later the health plan may take back a large portion of the authorized payment, increasing their losses. Independent pharmacies are also small business employers providing good jobs and contributing to their local tax base, while giving back to the community in the form of sponsorships, such as of local little league teams. Yet industry problems such as those described above hinder their ability to plan for the future and often force them to make difficult decisions about employment and community involvement. “I love being a trusted resource for my patients and being actively engaged in my community, but uncertainty in my payments for medications hampers my ability to do so,” said Harrell. “We need our elected officials to support policies that promote greater transparency in the marketplace, particularly for cost-saving generic medications which account for more than 80 percent of the medications I dispense. Insurance middlemen known as pharmacy benefit management (PBM) corporations may reimburse at an arbitrary rate and pocket the difference between the amount paid by the health plan and the amount reimbursed to the pharmacy to pad their profits at the expense of small business pharmacies such as mine. 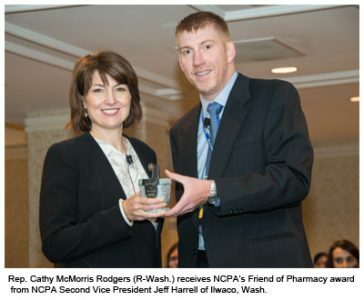 Acting as NCPA Second Vice President, Harrell presented Rep. Cathy McMorris Rodgers (R-Wash.) with NCPA’s Friend of Pharmacy award – McMorris Rodgers is the original founder of the Congressional Pharmacy Caucus. The NCPA Congressional Pharmacy Summit focused on advocating policies that promote transparency, such as H.R. 244, the MAC Transparency Act, and by encouraging regulators to implement proposed guidance that would bring greater clarity to hidden fees charged in Medicare plans. It will promote legislation key to ensuring patient access to pharmacies of their choice, including H.R. 793/S. 1190 the Ensuring Seniors Access to Local Pharmacies Act which allows any pharmacy to offer preferred cost sharing to beneficiaries and H.R. 592/S. 314 to recognize pharmacists as health care providers under Medicare. This entry was posted in Peninsula Pharmacies on May 27, 2016 by Brittany Greenfield. Are you our facebook fan? If so, you are eligible to take advantage of our specials & fan programs.